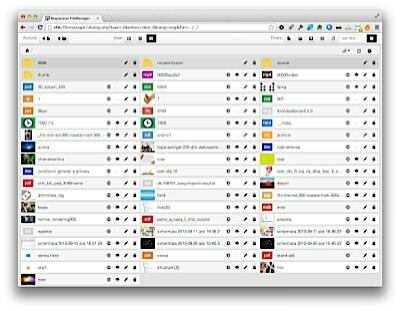 Responsive FileManager 9.14.0 is a free open-source file manager and image manager made with the jQuery library, CSS3, PHP and HTML5 that offers a nice and elegant way to upload and insert files, images and videos. 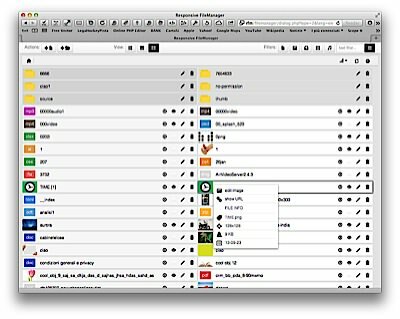 You can use it as external plugin for TinyMCE version 4.x(and older), CKEditor and CLEditor, you can also use it as a stand-alone file manager to manage and select files. The script automatically creates thumbnails of images for the preview list and can create also external thumbnails to use in your cms or site. It can be configured for automatic resizing of uploaded images or to automatically limit the size. 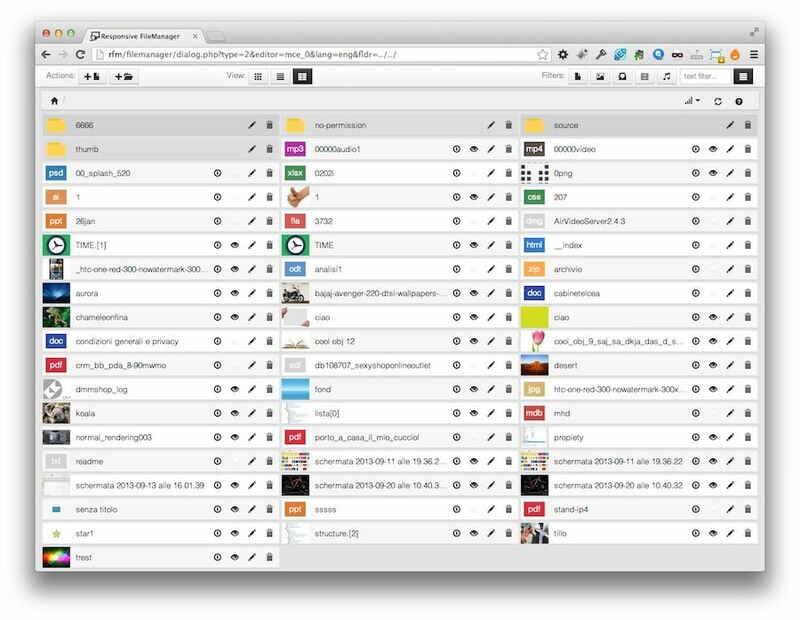 You can personalize the configuration for each folder. You can set a subfolder as the root and change the configuration for each user, page or FileManager call. 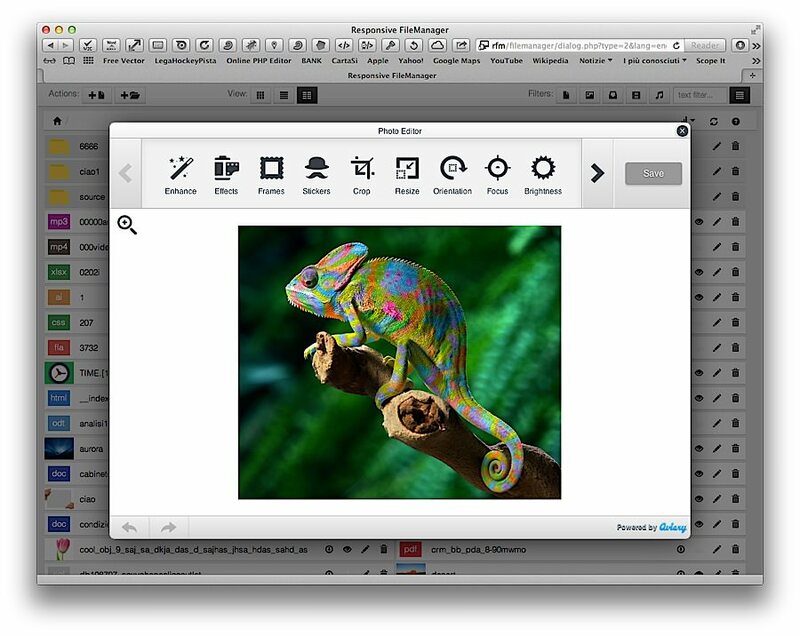 Is compatible with multi-user mode and you can edit images with aviary editor, sorting files. - Relative URL-s can be returned when selecting files from the filemanager: a 'relative_url' GET parameter should be added to the request with a value of "1" when opening RFM. Otherwise returned URL-s will be absolute. You can configure the actions in config.php file and disable/ limit them if needed. They will grey out if there's nothing on the clipboard. - Added bunch of comments and change a lot of codes. Now when loading a language it will search for the appropiate spritemaps. than server's ini it will revert it back to it. Simple to install and customise with a lot of configurations. Beautiful flat responsive design with Bootstrap. Is very simple to use for all users . "all great things are simple" (Winston Churchill). 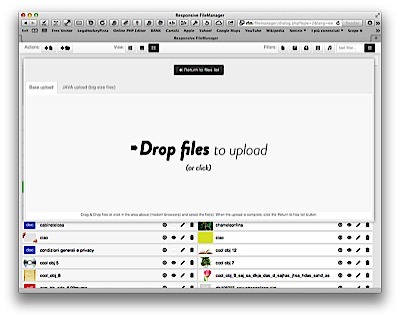 Upload the 'filemanager' folder where you want in your server (in the example is on root). Create a folder for your uploaded files and give it write permission (766). Open filemanager/config/config.php and edit the settings (read config.php parameters setting paragraph). Save file. NB Aviary Editor only works online; it won't work on localhost!! Great! Your work is finished! PS If you don't see the preview images you need to give write permission to the thumbs folder. If you are updating from a previous version of FileManager delete the contents of thumbs folder, the script will automatically re-create the thumbnails. "table contextmenu directionality emoticons paste textcolor responsivefilemanager code"
You can pass this variables on TinyMCE init. 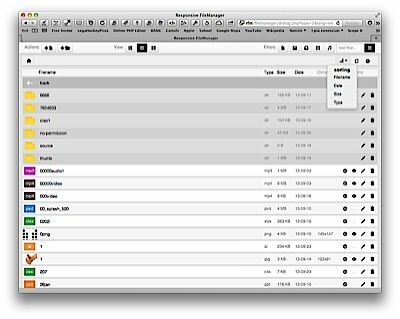 filemanager_title the title of filemanager window default="Responsive filemanager"
filemanager_sort_by: the element to sorting (values: name,size,extension,date) default=""
filemanager_descending: descending ? or ascending (values=1 or 0) default="0"
Include CKeditor library ans add the init script of CKEditor: The urls must point inside your filemanager folder so change they properly. If you want pass other config variables in the url (like language) please see the below "Get Variables list" paragraph. and that is all, click on "Insert Image" toolbar button, browse for image(RFM), select image, Submit, and now you have image in you cleditor. fldr: the folder where i enter (the root folder remains the same). default=""
sort_by: the element to sorting (values: name,size,extension,date) default=""
descending: descending? 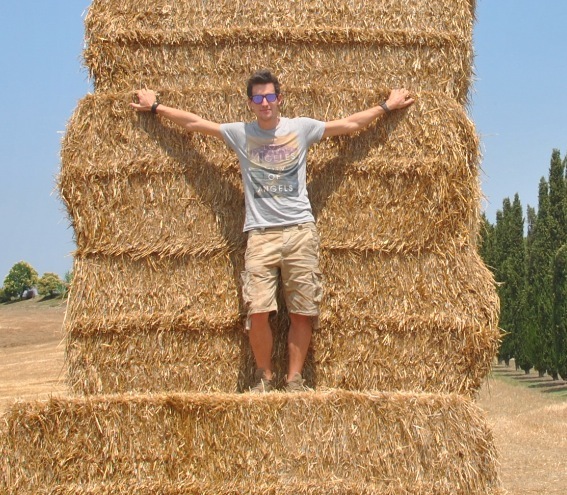 or ascending (values=1 or 0) default="0"
lang: the language code (ex: 〈=en_EN). default="en_EN"
In addition to this simple implementation there isn't security, because every php files include first config/config.php file. So if you want to permit access only to a logged users you can add all the controls at beginning of config.php file. With standard configuration responsive filemanager accepts all type of characters for file and folder names (like à é & ¥..., arabian, Chinese), if you want permits only latin charachters like A....Z a....z and 0....9, you can set to true the $transliteration variable on config.php . You can set a subfolder as root. So you can have a root folder for each user. The way to implement this is set the session variable $_SESSION["RF"]["subfolder"] ="subfolder/name/"
So if you want use filemanager in a multiuser CMS you can simply create a folder for each user and set a session variable ($_SESSION['RF']['subfolder']) with the name of the user folder. In Responsive FileManager you can customise the config.php for each folder. Simply create a config.php file inside your desired folder, and set the config array only with the element do you need to change. (Don't change current_path,upload_dir,base_url,root). You can also include an HTML text in the display folder page by simply inserting : 'folder_message'=>"html message" inside the config.php file in the folder. You can use this to specify restrictions or images resizing. Remember that the configuration of one folder is reflected in all its subdirectories. To enable cross-domain file selector, where files are hosted on one server (for example, serverA.com) and URL is being sent to another (for example, serverB.com), include crossdomain=1 in the URL. Then on serverB.com, the following code can be used to retrieve the URL after file selection is made. Please note, that the code is written for jQuery with FancyBox plug-in. There is extra parameter needed filemanager_crossdomain when calling tinymce.init(), please see below. base_url http://site.com base url of site (without final /). if you prefer relative urls leave empty. upload_dir /uploads/ address path from base_url to base of upload folder (with start and final /). current_path ../uploads/ relative path from filemanager folder to upload folder (with final /). thumbs_base_path thumbs/ relative path from filemanager folder to thumbs folder (with final /). NB thumbs folder must not reside in the upload folder. MaxSizeUpload 100 Max size upload limit in Mb. default_language en_EN default language file name. show_sorting_bar true show or hide the sorting feature. show_folder_size true show or hide the folder size in filemanager list view (very large folders greatly increase the calculation time). transliteration false active or deactive the transliteration (mean convert all strange characters in A..Za..z0..9 characters). image_max_width, image_max_height 800 these parameters set maximum pixel width and/or maximum pixel height for all images. if you set a maximum width or height, oversized images are converted to those limits. Images smaller than the limit(s) are unaffected. if you don't need a limit set both to 0.
image_resizing false activate or not Automatic resizing. if you set image_resizing to true the script converts all uploaded images exactly to image_resizing_width x image_resizing_height dimension. image_resizing_width, image_resizing_height 800 these parameters set the dimensions of the resized image. if you set width or height to 0 the script automatically calculates the other dimension. NB Very large images may cause the script to fail unless the server's php memory and time limit configuration is modified. default_view 0 set the Default layout setting. ( 0 => boxes, 1 => detailed list (1 column) , 2 => columns list (multiple columns depending on the width of the page)). ellipsis_title_after_first_row true if true the filename will be truncated if it runs beyond a single row. delete_files true allow or disallow file deletion. create_folders true allow or disallow folder creation. delete_folders true allow or disallow folder deletion. upload_files true allow or disallow file uploading. rename_files true allow or disallow file renaming. rename_folders true allow or disallow folder renaming. duplicate_files true allow or disallow files duplication. ext_img 'jpg', 'jpeg' allowed image file extensions. ext_video 'mov', 'mpeg' allowed video file extensions. ext_music 'mp3', 'm4a' allowed audio file extensions. ext_misc 'zip', 'rar' allowed archive file extensions. aviary_active true show or not show image editor button on context menu. aviary_key 1234567890 key available on aviary.com account. aviary_secret 1234567890 secred key available on aviary.com account. aviary_version 3 version of aviary. aviary_language en language of aviary (see aviary documentation to choose). hidden_folders "hidden_folder1", "hidden_folder2" set the names of any folders you want hidden. Remember: all folders with these names will be hidden (you can set any exceptions in config.php files in folders). hidden_files "this_document.pdf", "that_image.jpg" set the names of any files you want hidden. remember these names will be hidden in all folders. New image resized creation with fixed path from filemanager folder after uploading (thumbnails in fixed mode). 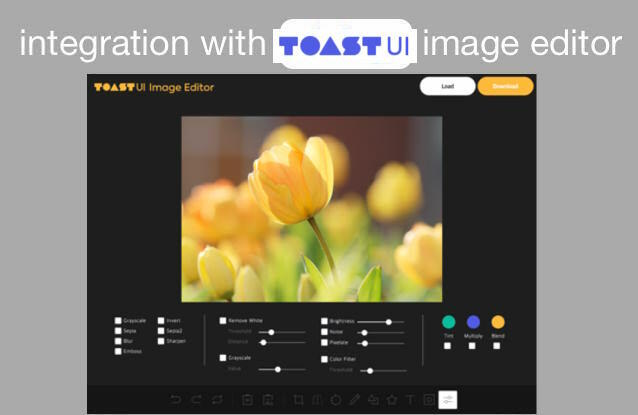 If you want create images resized out of upload folder for use with external script you can choose this method, You can create also more than one image at a time just simply add a value in the array. New image resized creation with relative path inside to upload folder after uploading (thumbnails in relative mode). 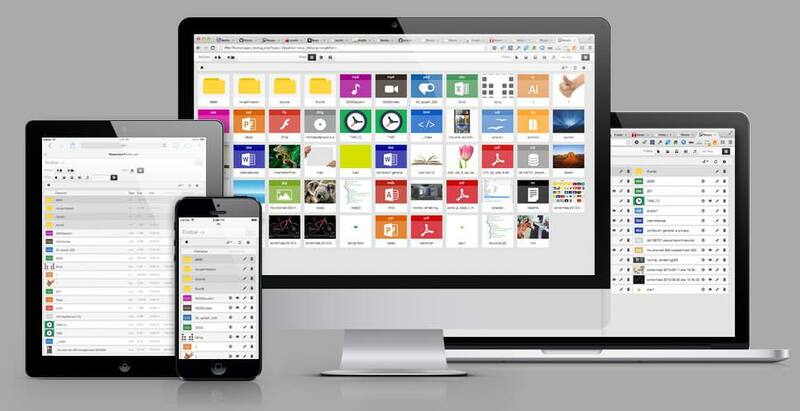 With Responsive filemanager you can create automatically resized image inside the upload folder, also more than one at a time just simply add a value in the array. 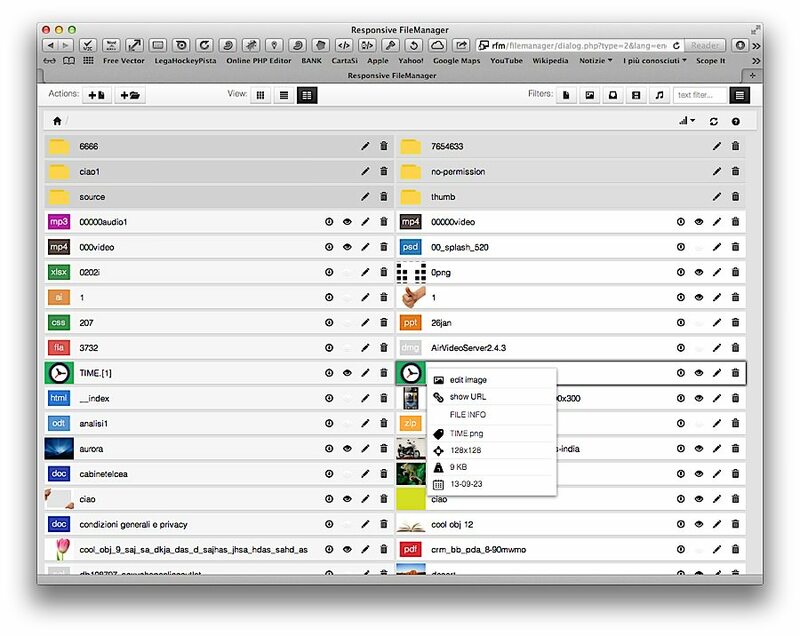 - With this plugin you can also set automatic resizing of uploaded images. - Moreover you can set the permits to delete files, folder and create folder. - For preview img in files list the plugin NOW create a thumbnail image with low resolution!!! 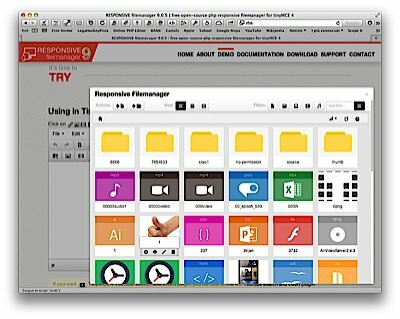 Responsive FileManager is licensed under a Creative Commons Attribution-NonCommercial 3.0 Unported License. 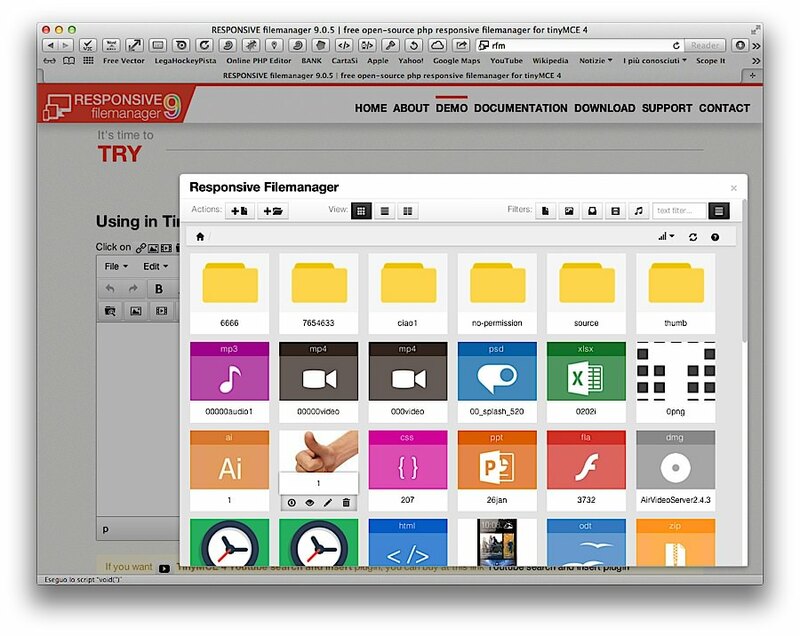 You are free to use Responsive Filemanager for your personal or non-profit website projects. 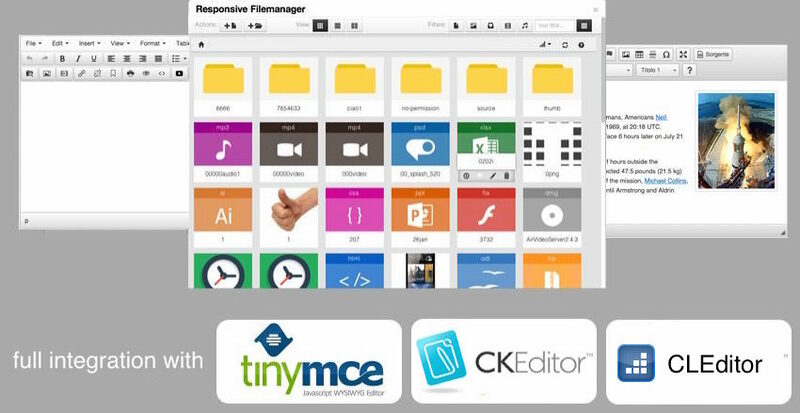 This free donation expresses how much you appreciate my work and how much you want to support the development of the responsive filemanager project. The latest source code is available on GitHub. hard working professional, a lot of experience in web application.